The holidays are here again, and with them come office Christmas parties, family dinners, and an examination of your life choices by relatives you only see once a year. Between all the inclement weather, social engagements, and shopping stress, your skin can take a real beating. To avoid acne breakouts during this stressful time, it is vital that you maintain a healthy skin diet for your own well-being. After all, knowing what food causes pimples now and how to avoid them will make it far easier on you when winter snows give way to spring beach weather. Acne, and Ashy, and Wrinkles — Oh My! Science has proven that there are many different factors that affect the quality of your skin. Too much exposure to the elements can leave it chapped and raw, but it’s easy to bundle up. Stress can cause wrinkles and acne outbreaks, but a trip to the gym or a hobby night can help your cope. Factors like age, hormones, medications, and environmental pollution can take their toll, but there’s only so much you can do about any of them. One skin health factor that’s easy to control, though many people struggle with it over the holidays, is your diet.The foods we eat are broken down by our bodies for fuel. By following a healthy skin diet, we can make sure that the nutrients our body gets are the right ones for clear, healthy skin. This goes beyond knowing what food causes pimples to understanding what goes into the foods we’re eating, and how to make those foods better for our skin. Maybe guilt-free is a little much — but there are ways to make your holiday favorites better for you while also making better choices about the foods brought by friends and family to get-togethers you attend. 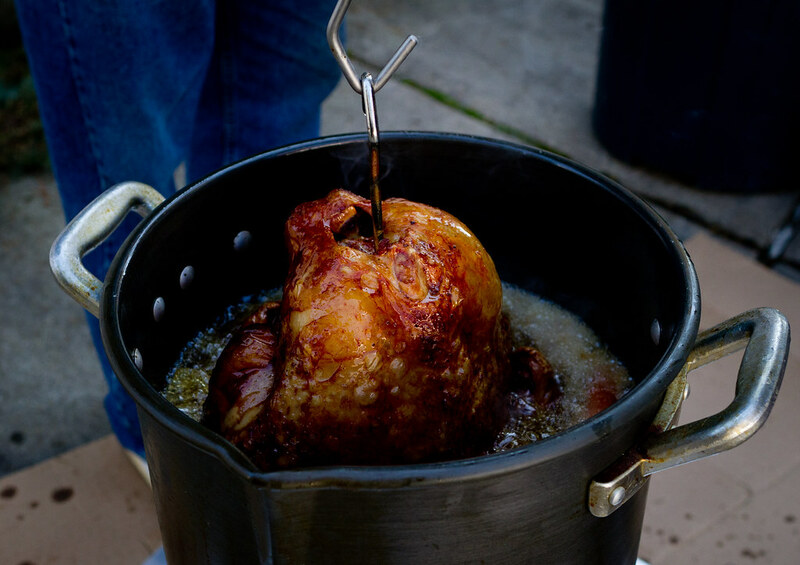 Fried turkey has fast become a favorite thanks to its rich flavor and moistness. Unfortunately, both of those qualities are the result of being immersed in fat. Fried turkeys are high in fat and cholesterol, two no-nos on any healthy skin diet. All that grease can lead to major acne breakouts and skin damage. Forgo the frying in favor of a turkey breast cooked in a slow cooker with a light brushing of extra virgin olive oil and spices. It will be flavorful tender and moist. If your family has to fry a turkey, eschew vegetable oil and the age spots that come with it. Instead, opt for a friendlier coconut or olive oil fried bird and make sure to use a good skin cleanser after eating. Too much butter offers some of the same drawbacks as fried turkey. High-fat foods can lead to breakouts. Worse, this high-carbohydrate holiday treat has a high glycemic index, further increasing the odds of blemishes.Instead of russets, choose sweet potatoes for mashing. They’re high in vitamins A and C, as well as fiber. The high fiber aids digestion, and properly digested food has a lower incidence of breakouts. Serve with a bit of cinnamon mixed with a small amount of brown sugar to help reduce butter consumption. These irresistible favorites are largely responsible for the uptick in gym memberships come January. A single slice of pie can represent over 500 calories — yikes! Much of those calories come from an extremely high sugar content, and can lead not only to acne, but wrinkles and dry, saggy skin.Stick to your healthy skin diet by baking a sweet potato pie instead. It has a better vitamin content, far less sugar, and has a taste and texture similar to pumpkin pie. For added flair, mix in some chopped pecans of grated coconut. Even gluten-free bread has a huge glycemic index, and stuffing is primarily made from bread soaked in water and fat. These are tasty parts to any holiday dinner, but they can leave you with dry, dull skin, wrinkles, and plenty of pimples. Choosing low-carb bread options and using vegetable broth in your dressing rather than drippings can help make these less of a healthy skin diet don’t, but you’ll still need to rely on a bit of self-control and moderation to get through. If you find yourself drawn to these starchy staples, make sure you are keeping up your skin care regimen to limit the damage. Is it holiday spirit or holiday spirits? There are plenty of holiday libations up for offer at parties, reunions, and for big games, but you’ll want to be careful. Too much alcohol can leave you dehydrated, damaging your skin. Egg nog, another holiday favorite, is packed with calories and often made with dairy, leading to increased oil production and blemishes. While going easy on the alcohol is usually a good idea at family gatherings, the desire for healthier skin gives you another reason for moderation. Non-dairy eggnog is readily available if you have to have a glass, but a better choice is organic apple cider. It’s good hot or cold, provides plenty of moisture, and is naturally lower in sugar. Remember that many of the foods you’ll see at dinners and potlucks spent some time in the canned goods aisle of your local grocery store. Yams, green beans, and corn are all tasty sides, but when they come from a can they tend to have a higher sodium content. Too much salt can lead to puffiness around your eyes and increased wrinkles.If your family simply won’t take no for an answer, make sure that you cleanse and moisturize thoroughly afterwards to help mitigate the damage. One of the easiest ways to lessen the consequences of holiday indulgence is to maintain your normal skincare routine. It can help your skin remain blemish-free even if your healthy skin diet slips a bit. Maintaining your daily beauty routine can provide the structure so many of us lose in the holiday hustle and bustle.That being said, it’s the holidays! Don’t be afraid to enjoy the festivities. As long as you understand the choices you have and their repercussions to your healthy skin diet, there’s nothing wrong with having fun. In addition to a healthy skin diet, the right skin care products can make sure you look your best in all those holiday pictures. We offer the best non-irritating, non-toxic products for a more radiant you. Order your healthy skin care products from Ayr Skin Care today.